Let Furniture123 take the stress out of buying furniture with our series of buyer's guides, produced in association with Real Homes magazine. A sofa is an investment that should last for years. You and your family will spend a lot of time using it (second only to your bed). So don’t even think about shopping for this essential piece of living room furniture until you’ve read our handy guide. A sofa is an important buy, so planning is essential. Make sure as well as measuring the area where you want the sofa to go, you also measure doorways and the width of corridors. 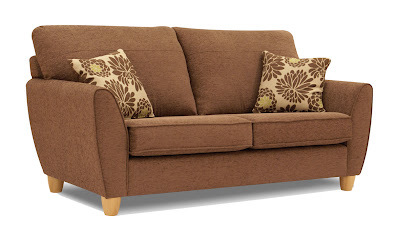 If you have small doorframes or not a lot of room to manoeuvre, look for sofas that have removable legs or arms. Also bear in mind that once the sofa is in your room you may not like it in its chosen spot, so have a back up and make sure you measure that space too. A good idea is to make a template out of newspaper to ensure a perfect fit. The size of sofa you need will depend on how many people are going to sit comfortably on it. It may be that you have a large family or regularly entertain, so think carefully about this when deciding whether to purchase a two seater sofa or a three seater sofa. Three-seaters are invariably more comfortable as sprawling out is always an option! Corner sofas are great if you have a small or awkwardly shaped room. They immediately free up more central space – but only if you have carefully measured up, ensuring that doors and windows can be opened comfortably. Corner sofas usually come as modular units, which slot together and give you added flexibility. If you have small children (or are prone to spilling things yourself! ), loose covers will be your saving grace. Most removable sofa covers can be washed at 40 degrees although they should never be tumbled dried as this could cause shrinkage. Many sofa stores stock loose covers in a range of colours – perfect if you want to update your living room on a budget. If you’re happy with your initial choice of style, fixed covers offer a more tailored look, but will need to be cleaned in situ. It may be the case that you just can’t find the sofa you want. If so it may be worth considering having a bespoke sofa made. More stockists than ever now provide a service in which an expert will come to your home to discuss exactly what you want, and weigh up the options available for you depending on the style of your room. It may seem obvious, but the colour of your sofa is hugely important, especially if you intend to buy a more expensive sofa. While that lime green sofa fits your living room scheme now, it may not in a few years time when you want something a tad more subdued. Neutral colours will never let you down on this front and, if you’re prone to changing your scheme, they can be easily updated with with cushions and throws. Click here to subscribe to Real Homes magazine and have expert advice delivered to your door every month! Furniture123 - buying living room furniture made easy! Pin It Now!